As they do every year, the Spanish Royal Family wishes Merry Christmas and Happy New Year to all! 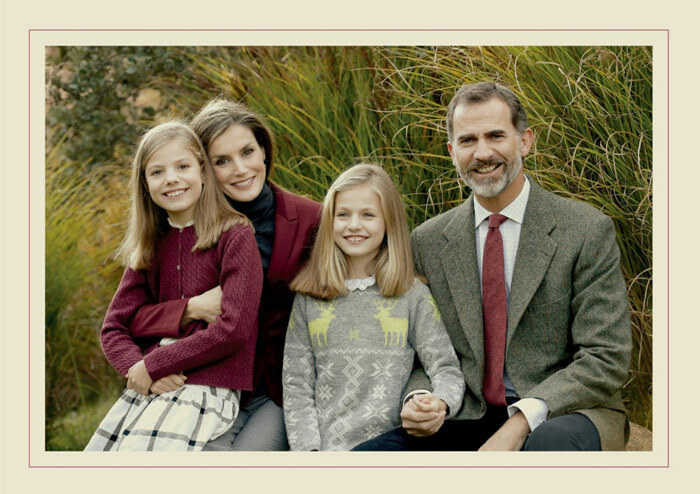 The King Felipe VI de España and Queen Letizia wish you a Merry Christmas and a prosperous New Year, with their daughters princess Leonor and infant Sofia from the Zarzuela Palace. This family portrait has been taken in the late November in the Zarzuela Palace. As it is a custom the Royal family’s felicitation is accompanied by the picture of Adoración de Los Pastores, authored by Juan Martinez Montanes that belongs to Sevillian monastery San Isidoro del Campo en Santiponce. Have a quick look at the gallery about the Royal’s X-Mas cards during the past decade. It is adorable how the princess Leonor and infanta Sofia have grown to beautiful girls, looking a lot like their mother Queen Letizia.